Victorious Marlins (133/365 v2.0) – Annoyingly Boring? Sadly, no Glennon representation this time around. But it was fun to shoot the last two games without having to sweat out the result on the field. Was glad the Marlins won, but there are good kids on both sides so either way it would have been alright with me. For those who have found all the Little League posts boring, fear not. The season is now over. You will have a solid nine months of non-Little League posts. For those who can’t get enough, the whole set of shots from this year’s season can be found here. What about those of us who find pretty much all of your posts boring? 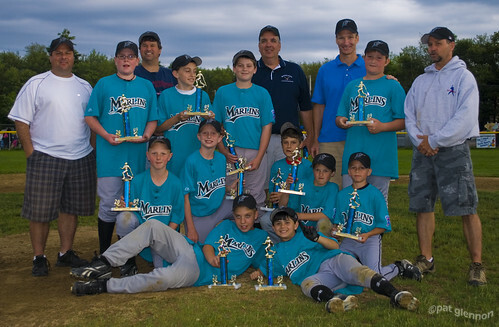 Brings back great memories of another Marlins LL team – the 2004 Novato, CA city champ Marlins. That team had a Glennon as the winning pitcher. He led off the bottom of the 6th with a double, starting the title winning rally. 5 coaches for 11 kids? Or did some guys just want to get their piccies taken? @kne: One of the kids was missing, but yeah, they had plenty of help. don’t think that all 5 were doing heavy duty coaching – the Dad who did the score keeping was in there. I guess if you have Dads that want to help I don’t think that they were going to turn them away.